Why do customers travel from as far away as Sacramento and Eureka to a little shop on Albany’s Solano Avenue every March and leave with bags full of crushed sumac, sprouted wheat, and flower-shaped chickpea cookies? To celebrate Norooz (also spelled Nowruz) or Persian New Year, a secular holiday, observed in thousands of homes around the world on the first day of Spring. On a recent foray to Zands, my neighborhood Middle Eastern store, I spotted an intriguing assortment of items artfully arranged on a table. I asked the owner, Monier Attar, about the meaning of the arrangement and she graciously described the symbols and traditions associated with this ancient holiday. Norooz, a pre-Islamic festival dating back at least 3000 years, is rooted in rituals from the Zoroastrian religion. This celebration of the first day of Spring originated in the geographical area then called Persia, but is now observed in many lands, including Iran, India, Iraq, Afghanistan, Central Asia, Canada and the U.S. It crosses religious and national boundaries and is celebrated by Persian Jews, Christians, Baha’is and Muslims. I am no stranger to symbolic foods (the Jewish Passover Seder plate includes horseradish for the bitterness of slavery and a fruit and nut mixture representing the mortar used by slaves for building structures in Egypt). But next to the food, I noticed several other items on the table– goldfish in a bowl, a mirror, a dish full of what looks like grass, coins in a cup of reddish spice– that pique my interest. Sabzeh, sprouted wheat or other grain growing in a dish, to symbolize rebirth. Samanu, a sweet pudding made from sprouted wheat that represents fertility and the sweetness of life. Seeb, apples, for health and beauty. Senjed, the sweet, dried fruit of the Lotus tree, for love. Sir, garlic, for medicine and good health. Somaq, crushed sumac berries, to reflect the color of the sunrise. Serkeh, vinegar, to symbolize patience and age. Preparations must commence days before the actual day of the vernal equinox and include a thorough housecleaning, sprouting the grain and buying new clothes for everyone in the family. The equinox is calculated to occur the moment that the Sun crosses the celestial equator and equalizes night and day, which happens at different times across the globe (see chart). This year, the West Coast will celebrate it Monday March 19 at 10:14pm. Attar grew up in Iran, but left in 1984, at age 35 with her 2 young children. This tradition is similar to the Chinese New Year tradition, where New Year’s bills are placed in red envelopes. Of all the dishes on the Haft Sin, the hardest one to procure is the Samanu. It takes days to prepare a sweet creamy pudding made from sprouted wheat that is cooked for many hours. The wheat must be sprouted for 5 days until white roots and sprouts appear, then it is crushed and the mash repeatedly “milked” and cooked on the stove for at least 5 hours. It is finally finished overnight in a low oven to give it that burnished brown hue. Another tradition is on the 13th day of the New Year, the family takes the Sabzeh (the sprouts growing in a dish) from their place on the table and after a picnic in the park, throws them into running water, to rid the house of sickness and sadness. Additional items on the table may include: golden coins representing prosperity and wealth, a basket of painted eggs for fertility, live goldfish in a bowl of water for life, a flowering hyacinth for its lovely smell, lit candles for enlightenment and happiness, a mirror to represent truth or reflection and a platter of special pastries. Every year, Attar makes thousands of cookies from chickpea flour or rice flour with nuts. The customary meal for New Year’s Day is Sabzi Polo Mahi, rice with green herbs served with fish. Attar says this is the Persian equivalent of having turkey for Thanksgiving. She carries fresh whitefish and the traditional herbs for the rice: parsley, coriander, chives, dill and fenugreek. 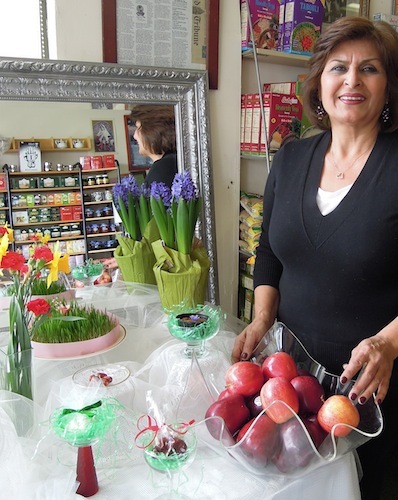 Norooz also has special meaning to Zohal Nassrollahi, Berkeley City College student and first generation American. “When I was a child, the event seemed very magical. I’ve always loved certain things on the Haft Sin table: the glowing gold coins, the maroon colored sumac,” says Nassrollahi, who studies art and design. This ritual traces back to Zoroastrianism, as a rite of purification. Bonfires are lit in the streets on the last Tuesday evening of the year and people leap over them while chanting. The translation, “Give me your beautiful red color, and take back my sickly pallor,” demonstrates the fire’s ability to cleanse. Attar carries the traditional snack of dried fruit and nuts to eat on Chahar Shanbeh Suri plus everything else one would need to fully celebrate the holiday. As she served me a cup of tea and some of her cookies, she told me Norooz (whose literal meaning is “new day”), is the perfect time to let go of grudges, apologize, hug and make-up and start over again. Norooz is included on UNESCO’s List of Intangible Cultural Heritage. This entry was posted in Middle Eastern Food, Persian/Iranian and tagged fire jumping, first day of Spring, Haft Sin, Monier Attar, norooz, nowruz, Persian New Year, vernal equinox, Zands. Bookmark the permalink. Anna, you are brilliant! This is a great post – both a learning experience and a whetting of appetite. I am looking forward to visiting Zands. Thanks, Tara! By the way, those little cookies that look like four-leaf clovers are gluten-free! Made with chickpea flour! Doubly good.